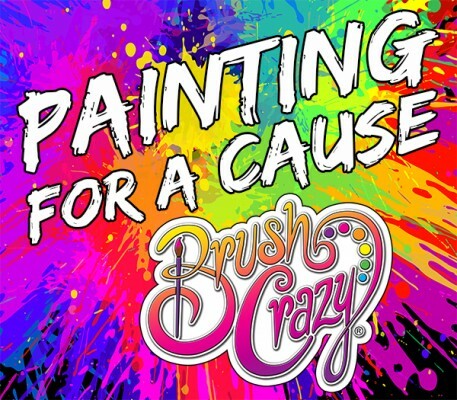 There's no better way to celebrate a special occasion than a Brush Crazy paint party! Get together participants young and old to enjoy an experience together that will let them take something with them to remember it by. Our packages are budget-friendly, and you won't find a more creative way to celebrate! Book a party outside of our regularly scheduled operating hours! You only need 6 or more painters or more than $210 in purchases to create your own party for up to 3 hours! Register online for a Party. We will send you a link to pay the $50 deposit. Your deposit can be used towards your party. After we have received the deposit we will send you a link to view the painting choices. If bringing smaller children parents allowed to help. If we are busy we will not have extra seats for non-participating adult and charge $10 per seat. You may choose for us to teach a painting for your group or you may choose to do Open Paint where everyone can do any project we offer*. *For Paint your Pet projects we need 48-hour notice and pre-payment for the canvas and sketch fee. During Open Paint some can do ceramics, others canvas, wood signs or board cutouts. You set your budget and if your guests wish to go over it, they can pay you the difference. All painting supplies are included in the price. Each participant can choose any painting or ceramic piece they'd like to create and follow written step-by-step instructions. Instructors will be on hand to answer questions, but this is a paint-at-your-own-pace experience. If you do not finish your project in one sitting, just take it with you and bring it back for free! No fee to reserve a table if less than 6 people in your party. Book an In Studio Event if you would like to reserve a table(s). You must have a minimum of 6 people; we can accommodate up to 150. Price is dependent on size of piece chosen to paint. Deposit required to secure date and space. If you cancel 48 hours in advance, you will receive your deposit in full. Your deposit may be applied to the balance of your event. You will be given a link to view the painting gallery online for 24 hours. Request new code for the gallery if you need more time. Ceramic choices change continually, come into the studio anytime to browse our selection. Let us bring the party to you! Both Open Paint and Painting Classes are offered off-site, so you get to choose how much guidance you want! There is a minimum of $500 in total participants to book an off-site event. Non-refundable deposit of $150 required to secure your date and may be used towards the event total. You must register and pay online or in person at least 48 hours in advance. There will be a mileage fee for locations greater than 15 miles outside of city limits. Want to paint a specific picture? Send us a suggestion to add it to our calendar!